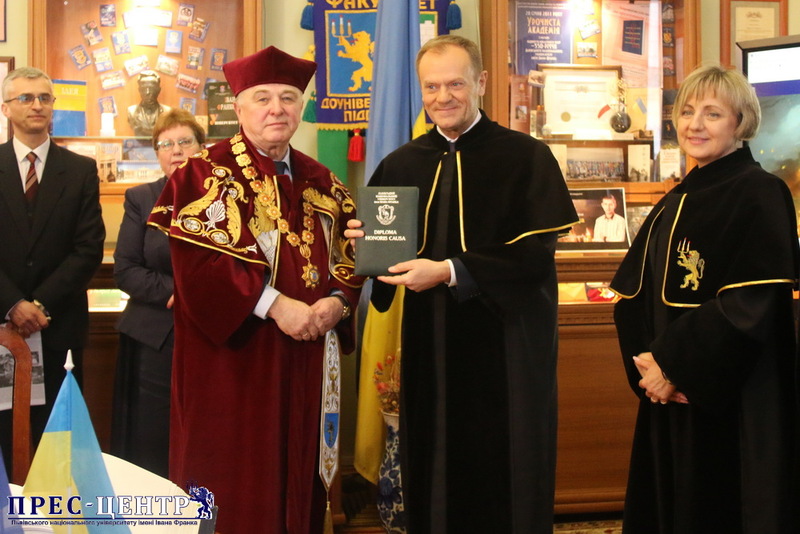 The range of honorary doctors of the Ivan Franko National University of Lviv is replenished with one of the most influential European politicians of our time, the European Council President Donald Tusk. The decision was adopted by the Academic Council of the University on February 1, 2019, however, the President Tusk’s personal visit to Lviv was made only on February 19-20 during a working visit to Ukraine. 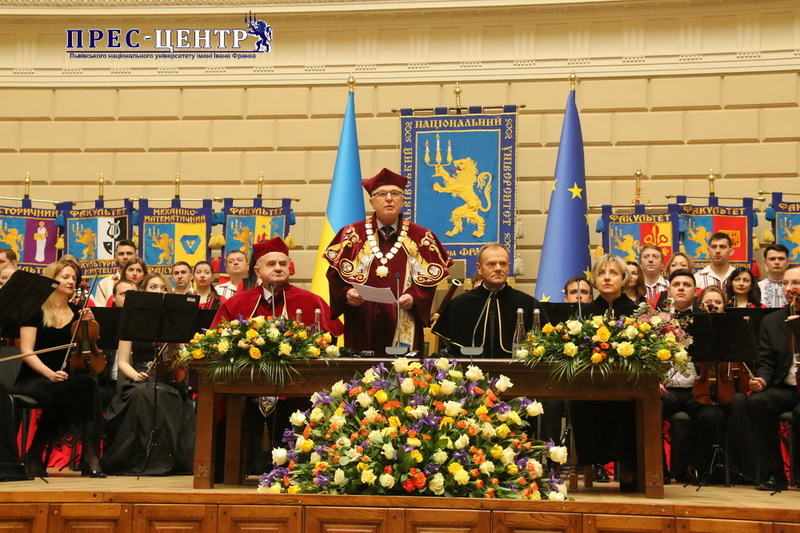 The participation in a solemn meeting of the Academic Council of Lviv University, awarding a diploma “Doctor Honoris Causa” and inauguration speech added a crucial value to his successful visit to Ukraine. 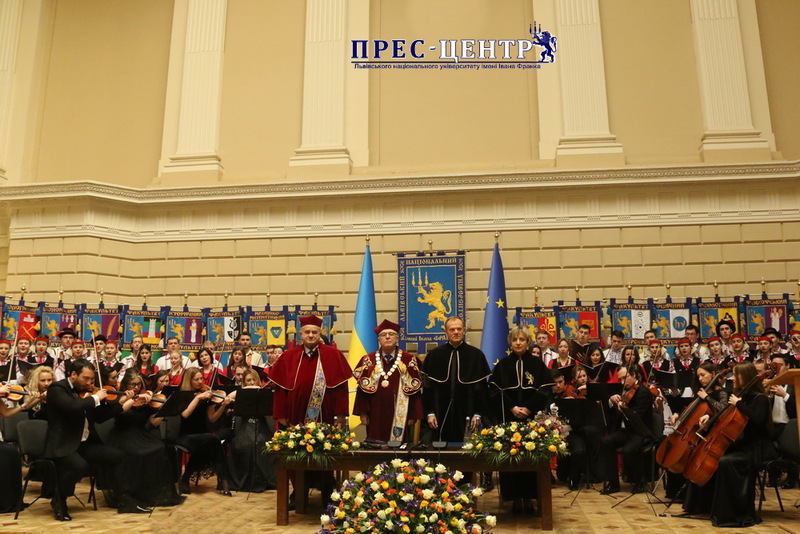 On February 20 the National Anthem of Ukraine and the Anthem of the European Union sounded together for the first time in the Assembly Hall of the University. 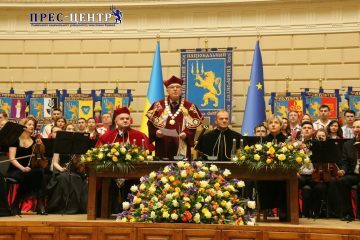 In honor of a respectable guest, anthems were performed by Academic Symphony Orchestra “INNSO-Lviv” of Lviv Regional Philharmonic ( director – Volodymyr Syvokhip together with artists of the Galician Academic Chamber Choir, the Cheremosh National Song and Dance Ensemble, and the Boyan Honored Choir Chapel named after Evhen Vahnyak. The Crowded Assembly Hall of the University welcomed the “Great Friend” of Ukraine standing, welcoming the unshakable pro-Ukrainian position of Donald Tusk during his all-time presidency of the European Council (December 2014). Rector of the Ivan Franko National University of Lviv, Corresponding Member of the National Academy of Sciences of Ukraine, Volodymyr Melnyk opened a solemn meeting of the Academic Council. Rector introduced Donald Tusk to the academic community of the University, focusing on the deep symbolism of the current event. “It is symbolic that our event takes place on the fifth anniversary of the tragic events of the Revolution of Dignity, whose participants were our students. They gave their lives for the approval of European values in Ukrainian society. And it is no less symbolic that we awarded the honorary doctor to a great friend of Ukraine – Donald Tusk, a follower and a supporter of the European integration aspirations of Ukraine. It was Donald Tusk who made a clear statement in 2015, after the Ukraine-EU summit: “Ukrainians are heading in the right direction. There is no better alternative. ” So could say only a worldwide-scale politician “, – said Volodymyr Melnyk.Probably, due to the principled position of Donald Tusk, the first President of the European Council, who came from a country that used to be an “Iron Curtain”, the theme of Ukraine has been on the agenda of the official Brussels for several years. Pole Donald Tusk, in the opinion of Volodymyr Melnyk, like no other European is deeply aware of the true aspirations of Ukrainians. “The key thesis of the Maidan was the slogan” Dignity and freedom – above all! ” Tusk, from the student’s lava, personally fought for these values. He understands, feels and cherishes the price of freedom. He is aware that young democracies need support. That is why the theme of Ukraine has become key to Donald Tusk’s political record as the President of the European Council, ” the Rector emphasized. After that, Volodymyr Melnyk presented Donald Tusk with Doctor Honoris Causa Diploma at the Ivan Franko National University of Lviv and invited a high guest to read a traditional inauguration lecture for the academic community. Donald Tusk warmly thanked the Rectorate and the whole scientific community of Lviv University for the opportunity to speak in his native language – in Polish. This was a personal request from Dr. Tusk, because, speaking primarily to the inhabitants of Lviv and his native Gdansk, he wanted his message to be heard both by the ears and a heart of others. “I knew that today I will be among friends, so I allowed myself this request. I am a Polish patriot and a European. I do not see any conflict here. I love Poland very much and I love Ukraine very much – here too there is no paradox. This is how to love my mother and fall in love with the girl “, – admitted the politician welcomed by the applause of the audience. The lesson of effective unity and reconciliation can be the controversial history of the development of Gdansk and Lviv. Both cities are multicultural, to the building of both involved representatives of very different peoples and religions, both of them at one time faced similar dilemmas: whose city is this? “Today, Gdansk and Lviv are city symbols,” said Donald Tusk. – From the Polish Gdansk and the Ukrainian Lions, the powerful signals of freedom were coming out. From Gdansk, this freedom went to the whole of Poland, and from Lviv to the whole of Ukraine. They should become leaders for all Ukrainians and all Poles. Leaders of the unity of our peoples “. At the end of his lecture, Dr. Tusk again turned to the wisdom of John Paul II, who, on the 60th anniversary of the Volyn tragedy, gave us all a unique lesson in a deep understanding of the essence of good-neighborliness. “The New Millennium requires that Ukrainians and Poles not remain enslaved by sad memories of the past. Thinking of past events in a new perspective and planning the construction of a better future for all, let them look at each other in terms of reconciliation. There is no justice without forgiveness, and cooperation without mutual discovery will be fragile. In a gesture of sensitive conscience, compassion and kindness, we will openly respond to the wishes of Ukrainians, similar to the wishes of Poland. We respect the memory of the victims, we will renew each of them by name. We owe these dead and their families … Let’s bend our heads together in prayer and compassion. The experience of the last century is so tragic and painful that it has taught us a new look at patriotism, national identity and we do not need to revolt against anyone or seek confirmation of confrontation. Today we find what unites us. We strengthen trust and cooperation. Today, there is no country that would value the role of independent Ukraine in Europe more than Poland. Each country would support Ukraine’s pro-European aspirations, ” the symbolic words by the President of the European Council became a promising hope of Ukrainians for the European future of the country. 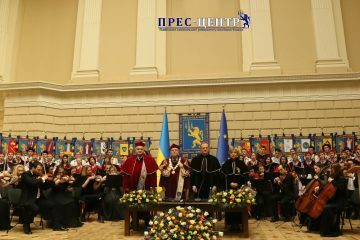 When the stormy applause of the hall finally subsided, the folk chamber orchestra of Lviv University (head – the Honored Worker of Culture of Ukraine Roman Burko) made another unforgettable gift to Dr. Tusk – he performed the famous “Melody” of the outstanding Ukrainian composer Myroslav Skoryk. In his turn, Volodymyr Melnyk, the Rector of Lviv University, once again congratulated Donald Tusk and the entire academic community and invited the new Honorary Doctor to actively participate in the scientific and public life of the University. At this ceremony meeting of the Academic Council was completed. However, Donald Tusk had long talks with the professors and students of Lviv University, willingly taking individual and group photos, and finally impressed everyone with a present present, giving a bouquet of flowers to the associate professor of the Ukrainian Literature Department named after academician Mykhailo Vozniak, Galina Kruk – the author of the famous poem about the Heavenly Hundred, which he quoted on the eve of his speech in the Verkhovna Rada of Ukraine. The Honorary Doctor left the Assembly Hall as a good and always welcomed friend of the University.